1. The breakfast burrito that quietly joined the menu at Paradise Bakery last June has become an instant hit. A hearty scoop of Stinkin’ Good Green Chile—the savory, pork-infused sauce marketed by former Denver Bronco Mark Schlereth—turns tender cubes of scrambled eggs, shredded cheddar, black beans, and potatoes into a luscious handheld feast. Extra napkins, please! 2. Build your own burrito at Big Wrap: owner Babs Menendez and crew will scoop any toppings onto flour shells upon request, but standard reigns supreme: eggs, pinto beans, roasted potatoes, cheese, salsa, and a double hit of extra-crispy bacon and chorizo. Hop on the gondola with it, but beware envious glares. 3. Home Team BBQ hits hunger out of the park with its bomb blend of house-made sausage, crispy tater tots, scrambled eggs, and sharp cheddar and Monterey Jack cheeses. A healthy schmear of guacamole is built right in—no judgment here if you don’t split it with a friend. 4. 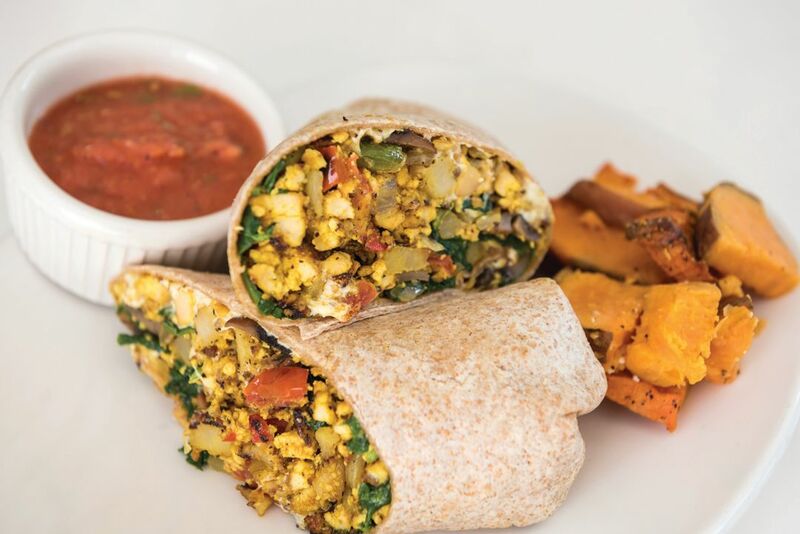 Perhaps most virtuous of the bunch is Spring Café’s Superhero Burrito, so popular at the all-organic, vegetarian eatery that it’s offered long past breakfast. Ooey-gooey dairy- and soy-free cheese enrobes scrambled eggs (or curried tofu), tender spinach, and a hearty mélange of mushrooms, potatoes, green peppers, and onions in a sprouted-grain tortilla. 5. Despite the lure of fresh-from-the-oven croissants, Franck Thirion French Pastry’s burrito is worth a drive to the Aspen Airport Business Center. Packing in roasted seasonal vegetables, crispy bacon, or spicy chorizo (or all three!) with eggs, potato, and cheese, the compact cylinders are scrumptious in any language.